Click HERE to view the layout of ALL 3 LEVELS including bed arrangements! 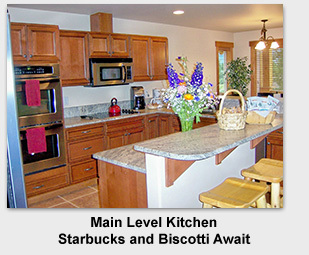 We have TWO FULL KITCHENS and 3 Dining Areas for large gatherings. We have AIR CONDITIONING! 3 separately cooled (or heated) zones for comfort! We offer SPECIAL LOWER RATES for SMALL Families & Groups. DISCOVER FUN & RELAXATION near Lake Cle Elum & the Suncadia Golf Resort! Enjoy having EVERYONE comfortably and safely "UNDER 1 ROOF"! and just minutes from Interstate-90 (easy driving all year). Our Guests' **REVIEWS** are at the bottom of THIS page. We offer special mid-week rates. ENJOY WEEKLY SUMMER REUNIONS & RETREATS! of "THE Cabin Near Suncadia" Vacation Rental Home, Ronald near Cle Elum. 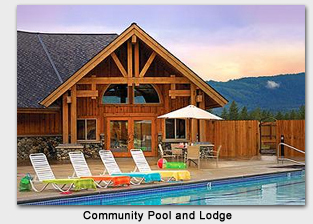 "THE Cabin Near Suncadia" operates a *PRIVATE* 8-PERSON HOT TUB ALL YEAR. FREE WiFi & UNLIMITED NETFLIX movies; & 5 TV's with ~80 Cable Channels. PING PONG BADMINTON, & BASKETBALL HOOP are waiting. Professional quality Pool Table (and Jr.-sized pool table, too) and Foosball. Memorial Day Weekend to Labor Day Weekend, & Fri/Sat/Sun in September. -- Having the ENTIRE FAMILY Comfortably & Safely "UNDER 1 ROOF"
-- Hobby Retreats & Weekends: Book Clubs, Board & Card Games, etc. -- Time Away WITH The Children! with all of the common areas, facilities, and amenities just for you. or children can camp out on the Loft, or in the Bunk Room. and a private bathroom for each. -- For 6 couples, the Bunk Room can be set up as a king-sized bed if desired. -- For Professional groups: 2-3 lower beds in each of the 6 bedrooms (with no shared beds, no upper bunks needed). NEW PHOTOS of ALL ROOMS & FEATURES/AMENITIES in our PHOTO GALLERY! ... and a new PRIVATE 8-PERSON HOT TUB, available all year! .... perfect for large extended family groups. The Cabin can sleep 5-25+ people comfortably, all in proper beds. There is also comfortable seating and dining for 30 people. Two separate living room areas & a large loft provide both space and privacy for everyone. There are three separate dining areas. The attached DIRECT ENTRY two car GARAGE provides easy access to the main level. This beautiful cabin in Kittitas County is perfect to enjoy quiet time away from the city or to spend quality time with family and friends. 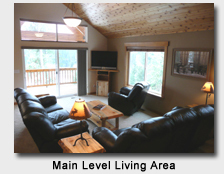 The Cabin is on a quiet cul-de-sac approximately mid-way between the Suncadia Resort and Lake Cle Elum. It is approximately 50-90 minutes from the Seattle metro area, minutes from Interstate 90. Features include two complete living rooms plus a loft, two dining areas plus a separate breakfast area (total seating for more than 30 people) and two full kitchens with stainless steel appliances (both are fully equipped with all basic cooking and dining supplies), slab granite counters in all bathrooms and both kitchens, and two sets of full-sized washers and dryers. Two large screen TV's (and 3 smaller screen TV's) with 86 Cable Channels, a full-size professional-quality slate pool table, a junior-sized pool table, a foosball table, and ping pong add to the fun The sitting loft includes TV & DVD viewing, great for children bringing favorite DVD's from home. Leather recliners and rustic cabin-style furniture add to the comfort and ambiance. There is free password-protected Wireless Internet throughout the entire Cabin. There is a large patio from the lower level, plus a balcony off the main living room. Patio furniture is set up during mild weather. The Cabin is fully air-conditioned for comfort during the warm summer weather, with 3 zones of Heat/AC for comfort for everyone throughout the entire Cabin all year. (including freshly laundered duvet covers to welcome each arrival). and Calvin Klein & Bloomingdales (kings and queens). - We are pleased to provide MOLTON BROWN bathroom hotel-style amenities. 4 complete sets of cookware, plus large stockpots). (no need to worry about little feet encountering broken glass). Come see what Suncadia, Ronald, Roslyn, and Cle Elum have to offer! Within just a 50 to 90 minute drive from the Seattle metro area, you will find sunnier and warmer summers and colder and snowier winters. Enjoy the local seasonal fun of golf, snow mobile rentals, horseback riding, hiking, biking, boating, cross country skiing, fishing, bridge jumping, lake swimming, snow shoeing, down hill skiing, river rafting, museums and historical town walks, movie theater, dining, and access to all Suncadia public facilities (including Suncadia's Prospector & Rope Rider golf courses), Glade Spa services, fine dining at several restaurants, ice skating, bicycle rentals for families, and concerts, and more...). Local activities include wandering around the old mining town of Roslyn (renamed "Cicely, Alaska" for the TV series "Northern Exposure"). All of this is within a few minutes' drive from the Cabin. Snowmobiles ARE allowed in Roslyn Ridge in the winter. Sorry: Absolutely NO PETS and NO SMOKING are allowed. RECENT REVIEWS OF "THE Cabin Near Suncadia"
We all had a wonderful time there and made good use of your hot tub, pool table, ping pong table, foosball table, and kitchens. The layout worked very well for us. We were able to separate the family with the small children from the noisier areas, have enough space that people could get away for a little quiet time when needed, but not be so spread out that we missed one another. I even organized a "triathlon" on the last day with points awarded for games won during single elimination tournaments on each of the three tables. We had some great games, lots of fun, surprising upsets,, and a nice distribution of "winners". I used the logo gifts you left as the prizes so every family walked away with something. I will definitely keep your home in mind for any future get-togethers. And if you ever need a reference, feel free to send them my way. Thanks again for providing the location/comfort/cleanliness/furnishings/ provisions/games/etc. of such an important family get-together. "... WE LOVED BEING UNDER ONE ROOF... [&] THE COMFORT..."
It's very hard to describe to you how we all felt about your house. We loved the lay-out, spaciousness, and well-stocked kitchens. We loved being under one roof, all together and it made our holiday very special. We loved the comfort that your house afforded us, in spite of being such a large group. I would highly recommend your house to others as we have had a few enquiries from friends. You have done such a great job of everything from toiletries (Molton Brown) to ping pong paddles and balls and your hospitality baskets (coffee, tea, etc.). We appreciated you arranging a preview of your house before our stay. That allowed my husband to design a rack to be able to hang our grandchildren's Christmas stockings on your mantel. (He made the frame of PVC pipe. Please note, nothing was attached to your mantel.) I will send you a picture of that in a separate email. "... A WONDERFUL VACATION TIME TOGETHER AS A FAMILY"
Just a quick note to let you know that we left right at noon today after a wonderful vacation time together as a family. It turned out to be far more fun and memorable that I think any of us anticipated. Having the different areas for beds and bathrooms gave everyone just enough personal/family space yet wonderful living/eating areas to gather and spend time together. You have done a wonderful job of providing every kitchen appliance, utensil, dish, etc., anyone could possibly need. King beds were wonderfully comfortable and linens for the baths and pool towels were great. We loved eating on the patio and watching the stars in the hot tub. All-in-all, it was a wonderful vacation time together. I think everyone hopes we can repeat it again at your cabin. In the meantime, every time we look at our little stuffed moose or coffee mug, we'll think of the wonderful time we had... that was a very special touch! "... A WONDERFUL 60TH ANNIVERSARY WEEK!" I wanted to let you know that our security deposit arrived, and to thank you for taking care of it so swiftly. Thank you too, for making our stay so pleasant. We followed your suggestions of things to do and see, with the young people hiking and biking, all enjoying the pool and hot tub and fire pit. Everyone spent an afternoon having lunch at the Roslyn Cafe, poking around in the shops, and the very interesting coal museum. We have a few geologists, engineers, and high school teachers in the group, who all found things to be very interested in. Card games and dominoes and the pool table were evening pastimes, with 3 generations competing. I'll admit that [husband] and I found plenty of time to just sit on the deck and read, looking up frequently to admire the view. We were lucky with the weather, too, so spent lots of time out of doors. All in all, it was a wonderful 60th anniversary week! "WE'RE GOING TO KEEP COMING BACK TO YOUR CABIN!" So needless to say, we're going to keep coming back to your cabin! "YOUR HOME HAS BEEN OUR FAVORITE PLACE..."
We are excited about the upcoming family get together. Your home has been our favorite place from a long line of places we have gone each year. I love that we are all under one roof and not split between hotel rooms or condos. The snow helps the Christmas mood as well. The slow cookers will be greatly appreciated! Thanks for adding those. At this point, I can't think of anything else needed. It is a well stocked house and the two kitchens have been a total blessing for cooking big family meals. When I was given your contact info from "M", both "M" and "B" couldn't say enough nice things about you. They kept telling me how nice you are and great to deal with. "WE ALL LOVED IT ... RENEWING OF OUR VOWS"
We can't say enough how special our time was at "The cabin near Suncadia". enjoyed playing pool, foosball and Wii downstairs. for us all - she was very impressed that the kitchens were so well stocked. chance will forward some photos of our family on to you. from others that we've spoken to as well. "…having a great time and love your house and its amenities…"
"Incredible house in an incredible area"
"We loved our stay! Incredible house in an incredible area. Lots of rooms for lots of people with a great master suite on the middle level. The downstairs was perfect for our students with the hot tub, pool table, and big TV. We took our High School kids from church and they were fully entertained the entire weekend. The scenery was spectacular and the little towns of Roslyn and Ronald are always fun. Highly recommend this as a great place to spend a relaxing weekend with a big family (or two!)." Thanks again for everything, Pennie. We'll be in touch! Well….you are doing a great job! The house is wonderful and we will certainly be passing your name on for larger vacation rentals. They are hard to find (we have traveled so much with our large group, we really love the bedrooms and this would also be a great place to bring kids since each bedroom could be a family room with the bunks.) I’m in the Master Suite right now on my conference call and am sitting by the deck. I also wanted to compliment your cleaners…this house is in perfect shape. (being new helps, but keeping it looking like new is a good thing!) I will not bring my laptop to the pool…my husband will kill me, but I love that wireless is up there!! Almost done with “work” and get started with vacation…but I can tell you sitting by the deck in this great chair looking out to the mountains is a GREAT way to work! Thank you for sharing this beautiful location with us……. 5 Couples, reserving again for next year! Hi Pennie -- Thank you for a wonderful weekend. Our family really enjoyed your home. It was so perfect for the 5 couples with space for everyone and especially bathrooms for everyone!! We thoroughly loved it. We liked it so much that they all have asked me to write to you to see if we can rent from you for next year. The weekend next year would be [dates]. Also I have another question for you. My family (our kids and grandkids) do a [holiday dates] weekend getaway every year. I was wondering what you would charge for the house for that weekend for Friday and Saturday nights. We do have a place reserved for this year, but your place is so much nicer and I would love to bring the family to your home instead [in the future]. We would want the hot tub again too. Hi Pennie! I am back at work - what a drag. I cannot express how much fun we had at your cabin. It was absolutely perfect for our family and the number of people. I have been bragging all day to my co-workers. We purchased a spare propane bottle and placed it on the deck of the main floor by the BBQ grill. It was $48 from the local hardware store. This includes the filling with propane as well. Again, we appreciate everything. I will also forward some pictures to you! "I wanted to tell you what a wonderful home you had in the Cascades. We had a really wonderful time. With our big family we especially loved the two levels because the kids could be loud and have fun while the rest of us were happy to be quiet and talking. And Roslyn is such a swee town. I got to know the local librarian and the post master and some of the local farmers. It was a treat. We really had a very nice time. Please don't hesitate to give us as a refernce & should you want to have a potential guest call me, that would be no problem at all." The Cabin Near Suncadia, Copyright © 2009-2010 WGRR, LLC. All rights reserved.